Joe Biden 'Very Close' To 2020 Decision As His Family Gives Its Blessing The Democratic former vice president said that he still has to decide "whether or not I am comfortable taking the family through what would be a very, very very difficult campaign." Former Vice President Joe Biden said Tuesday that he's "very close" to reaching a decision on whether to run for president in 2020, but that his family has given him their blessing if he does. But among those dearest to him, Biden said, "There is a consensus that they want me to run." He also said he's "very close" to a final decision — that includes input from his wife Jill, son Hunter, daughter Ashley and his grandchildren, who had "prodded" him to launch a campaign for president. "We do everything by family meetings, because no man or woman has a right to run for public office without it being a family decision," the former longtime Delaware senator said. Even with their blessing, the 76-year-old Democrat still sounded somewhat hesitant given what is sure to be a grueling campaign involving a crowded Democratic primary field and likely a brutal general election campaign to try to unseat President Trump. 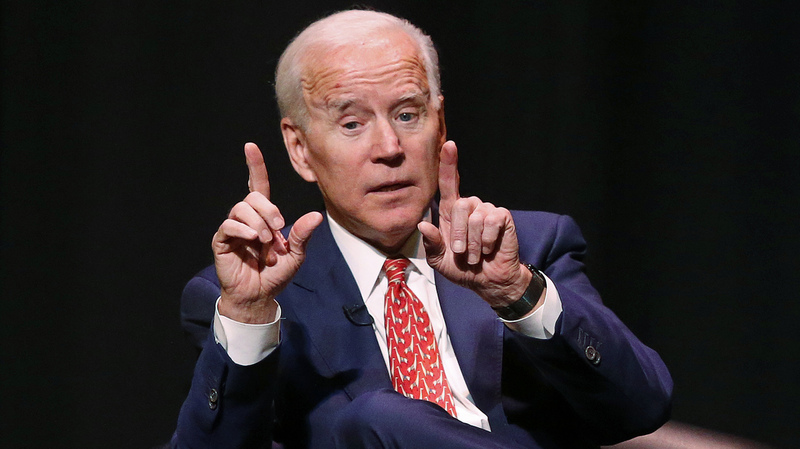 "No matter who runs — it's a very difficult campaign," Biden said. "The primary will be very difficult. And the general election, running against President Trump, I don't think that he's likely to stop at anything, whomever he runs against." Family concerns were largely what kept Biden from running in 2016 to succeed his boss President Barack Obama. His eldest son, Beau, had just passed away in 2015 from brain cancer at only 46 years old. Biden struggled with whether he could mount a credible campaign while dealing with such a significant loss; eventually, he decided the time had passed for him to run. "As my family and I have worked through the grieving process, I've said all along what I've said time and again to others, that it may very well be that the process by the time we get through it closes the window. I've concluded it has closed," Biden said in the White House Rose Garden in October 2015 alongside his wife and Obama. But Biden has clearly missed being in the mix, after a nearly four-decade career in the Senate before becoming vice president. He has been urged to run by many in his party who believe he could appeal to white, working-class voters that 2016 nominee Hillary Clinton failed to win over from Trump — leading to the president's crucial wins in Rust Belt states like Ohio, Pennsylvania, Wisconsin and Michigan. However, the Democratic race for the 2020 nomination is shaping up to be a primary battle unlike in previous elections, with a push for a more progressive candidate and many who argue it's time for a younger, more diverse standard-bearer as well. A dozen Democratic hopefuls have already entered the race, including several senators, minority and women candidates. Those variables also seemed to be factoring into Biden's looming decision, as he told the crowd Tuesday that "the second piece is that I don't want this to be a fool's errand, and I want to make sure that if we do this, and we're very close to getting to a decision, that I am fully prepared to do it." Biden said things would be much different from his past runs for office given the new media landscape, the growing importance of social media and whether he can "fund this campaign on my conditions," including not having a superPAC. The former vice president said he was also looking into finding out "this alleged appeal that I have — how deep does it run? Is it real?" "I can die a happy man having never lived in the White House," Biden said. "But what I don't want to do is I don't want to take people's time, effort and commitment without there being a clear shot that I could be the nominee. I think we can." "I think that's where we are, but there's still a couple hurdles to go through to make sure we have all this in place and we conclude that — I would announce, and I would run for president." As Biden began to close his remarks, someone in the crowd yelled, "Just say yes," and Biden smiled and responded, "But I'm not there yet." "I have not made the final decision — but don't be surprised," he teased.